Book a skilled lawn pro in Arlington. Backed by a total satisfaction guarantee and amazing customer support. The charming town of Arlington is richly steeped in history, with its fascinating museums the store that your grandmother visited when she was a little girl. 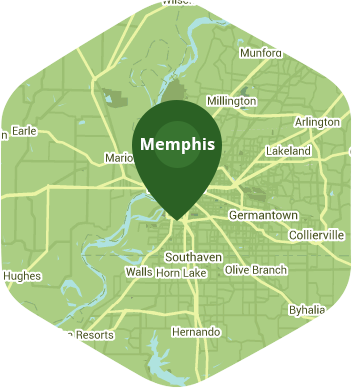 Even though you have all of the conveniences of Memphis on your doorstep, you still have the advantages of living in a place where neighbors meet up at the farmers' market, and where the sense of community permeates everything you do. At Lawn Love, we want to help you make Arlington as pretty as can be, starting with your very own lawn. Our independent lawn care professionals know exactly what's needed to transform your lawn into a thick, healthy vision of emerald green, and to keep it that way, year after year. What could be better and easier than booking your lawn care through your phone or computer, and then getting on with your day? So let's chat! Give Lawn Love a call at 901-410-4492, or take advantage of our convenient two-minute quote, and get the beautiful green lawn of your dreams - effortlessly! Ryan introduced himself and got right to work. Did everything I hoped he would and the yard looks great. Polite and did a great job. She always does a great job, yall are lucky to have such a hard worker lawn provider. The two men that came to do my yard were professional, friendly, and really seemed to know what they were doing! They did an absolutely amazing job and definitely went the extra mile. I will certainly use Lawn Love again! Did a great job!! And quickly! Perfect! Could not ask for a better pro! What a fantastic job! I'm impressed. She does a perfect job every time! Looks good. I'm very satisfied. John was really accommodating. I appreciate his help and look forward to his next visit. My lawn pro is awesome. Another great mowing and trimming yard. He’s the best!! He was fast and got the job done right. I love love love John he is the best. We have had alot of rain and grass thick and high,but great job under difficult circumstances.I really appreciate the professionalism! LaQuinta Smith did an awesome job on my lawn. My yard was beautifully cut, edged and the weeds were also removed that was growing on my front yard fence. I give this exceptional employee 10 thumbs up if I had them - Great Job! Rated 4.71 / 5 stars in 1,892 Arlington customer reviews. It looks like the expected precipitation in Arlington is 0.01 inches, which means you will probably have to water your lawn today. Dusk and dawn are the best times to water your lawn (the sun will rise at 6:16 AM and set at 7:37 PM today in Arlington). Here are some average lawn care prices for homes in Arlington. Average lawn size 6,579 sq. ft.